William Byron looks on during XFINITY Series pole qualifying (Sean Gardner/Getty Images North America). 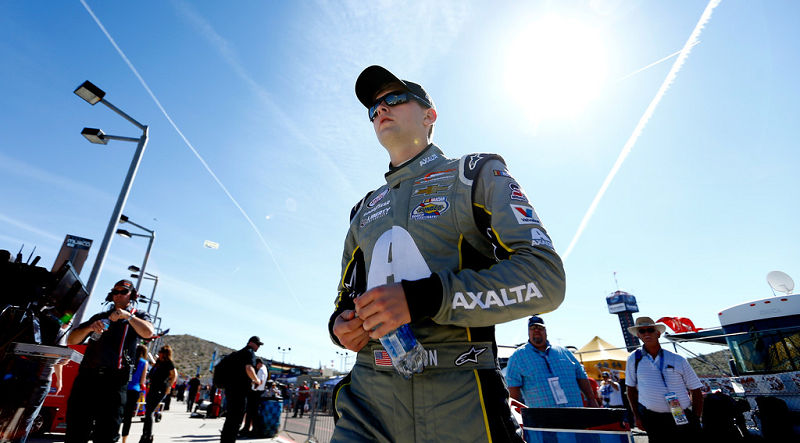 AVONDALE, Ariz. — It didn’t take long for XFinity Series rookie William Byron to get up to speed in NASCAR’s second-tier series. Byron scored his first career 21 Means 21 Pole Award Saturday morning at Phoenix Raceway. The JR Motorsports driver laid down a lap of 26.969 seconds in the final round (133.487 mph) to secure the top spot. Two-time Truck Phoenix winner Erik Jones was fastest in round two but wasn’t able to knock Byron off the pole and starts second for this afternoon’s race. Jones qualified best among Cup drivers with Austin Dillon right behind in third. XFINITY Series regulars Blake Koch and Justin Allgaier rounded out the top-five. Byron was second-quickest in the second round behind Jones and admitted that he made a mistake. Points leader Elliott Sadler was sixth and Darrell Wallace Jr. led the Ford camp with a seventh-place qualifying effort. Rookies Matt Tifft and Cole Custer were eighth and ninth, respectively as Brendan Gaughan completed the top-10. Eight cars were unable to post a lap due to not getting through inspection which included Cuppers Ryan Blaney (33rd) and Daniel Suarez (34th). Blaney led opening XFINITY practice while the No. 22 team hasn’t won a series race since Nov. 2015 at Texas Motor Speedway. Daniel Hemric, Dakoda Armstrong, Brandon Jones, and Ross Chastain will also start from the rear. 40 cars showed up this weekend so no one went home. The green flag for the DC Solar 200 drops shortly after 4 p.m. ET (1 p.m. PT) and can be seen live on FOX.